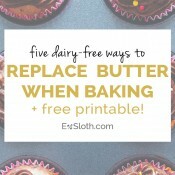 If you’re a long time ExSloth reader, or have spent any amount of time poking through the recipe archives, you’d know that I hardly ever use refined sugars in my recipes. Originally, that was because I cut out sugar altogether when I first started eating healthy. I have a massive sweet tooth and at the time, that was the only thing that helped my curb my incessant sugar cravings. Now, I have a bit more self-control, but I still stay away from refined sugars in the kitchen since they’re not exactly healthy. Plus, recipe testing with sugar substitutes is actually pretty fun- although it can be challenging. 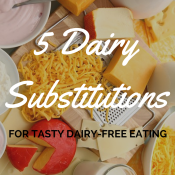 So, today, I wanted to share some of my favourite alternatives to refined sugars with you, as well as some tips on how to make substituting easier. 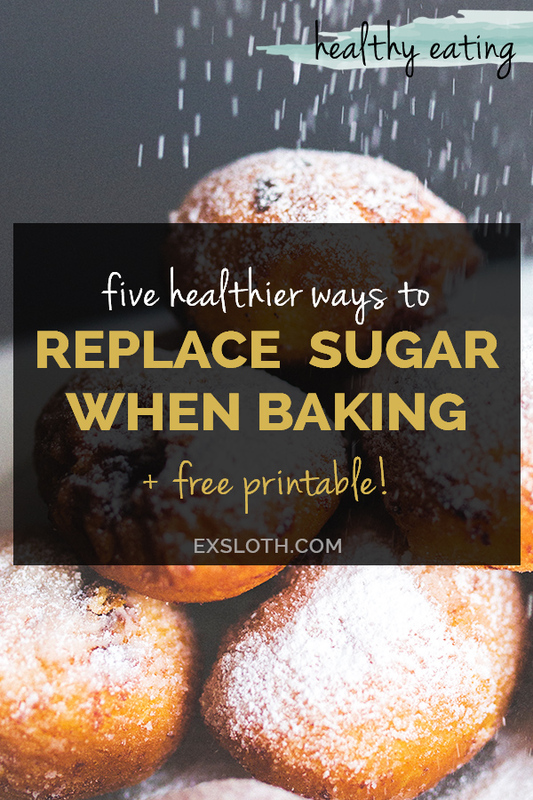 I’ve also included a printable cheat sheet to help you easily replace sugar when baking on the go. If you’re already a subscriber, check the subscriber only area and you should see the printable there. If not, just hit the image below! Note: Sugar is still sugar no matter the form. While these 5 substitutes for refined white and brown sugars are marginally healthier, they should still be consumed in moderation. I probably use maple syrup in 95% of my baked goods, mostly because I absolutely love the flavour. Because it’s a liquid sweetener, substituting sugar with maple syrup hardly ever works in recipes as is. You need to play around with the quantities of other liquids bit before you can get something that works. It’s also important to note that maple syrup has a distinct flavour, so depending on the grade you use, the flavour of your baked goods may be affected. Plus, it’s brown, so when substituting white sugar with maple syrup, the finished product may be a bit darker than usual. Substitution Tip: I’ve found that replacing one cup of sugar with 3/4 cups maple syrup usually works if you lower the amount of other liquids in the recipe by 2-3 tablespoons. For cookies, I also like to refrigerate the dough for a bit so it can set a bit before baking. Applesauce is one of the first sugar substitutes I ever made. The first attempt was pretty horrible – my muffins turned out gummy and chewy, but eventually I got the hang of it. What I like about applesauce is that, if you use the unsweetened kind, there aren’t any added sugars at all. The sweetness is all natural and it works really in muffins and sweet breads. For baked goods that need a little more sweetness, I like to sub sugar with half applesauce, half maple syrup. It takes a little more tinkering but it works. Substitution Tip: There’s a lot of liquid in apple sauce, so while you can sub it 1:1 with the sugar in the recipe, you need to reduce the other liquids to suit. A good starting point is reducing the other liquids by 3-4 tablespoons for every cup of applesauce added. Before my maple syrup obsession, I substituted sugar with honey in almost all recipes. But, unlike with maple syrup, I’m not always a fan of the taste of honey in my baked goods. When I was younger, my grandmother would make us drink honey and lime or lemon if we had a sore throat. Unfortunately, I can’t always get past the honey/sickness association, so I don’t use it very often. But, if you’re not a picky as I am, or you just plain love the taste of honey, it’s a pretty easy substitution. Substitution Tip: Replace every cup of sugar with 3/4 cups honey and reduce other liquids by 1/3 – 1/2 cup. Honey also browns faster than other sugars, so you need to reduce cooking temperature by 25 degrees to avoid burning. Agave isn’t something that I have much experience with. I’ve used it once before, but that was mostly because maple syrup is crazy expensive in Trinidad and I didn’t want to waste the little I had on a popcorn bar experiment. Either way, agave is a good substitute for sugar because, while it still has a fructose content, you need a lot less of it to achieve the same level of sweetness. Substitution Tip: For the best results, you should replace each cup of sugar with 2/3 cups of agave and reduce other liquid in the recipe by 2-4 tablespoons. And, as with honey, agave browns faster than other sugars, so you should also reduce the cooking temp by 25 degrees. Coconut sugar is a new addition to my kitchen. It’s not exactly cheap so I put off buying it for a while, but last month I finally caved while doing my bulk food shopping. It was on sale at Bulk Barn so I snapped some up. I haven’t used it to bake yet – only in my coffee – but from all the research I’ve done, it’s a straight 1:1 substitution with regular sugar. 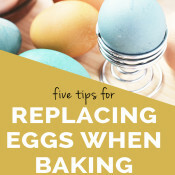 Of course, it’s more coarse than white sugar so it’s more easily substituted for the brown sugar in a recipe, but replacing white sugar with coconut sugar isn’t impossible. You just need to be prepared for a less smooth texture in the finished product. Are you a sugar fiend like me? 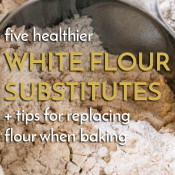 Do you use refined sugars when baking? What is your favourite healthier sugar substitute? I just to some simple stevia or let all the wonderful fruit purees shine! I’m not a huge fan of the taste of stevia but I can def get on board with straight up fruit purses! A very useful and well written post Giselle! I have never tried Coconut sugar but have added that to my grocery list now. Thank you! I love these ideas! I’m a much better cook than baker, so it will probably take me a lot more tinkering time with the recipes, but I’d love to eventually nail it. I am totally with you – trying to avoid refined sugar where and when I can. Thanks for posting this! Informative and inspiring! 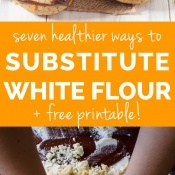 Have you got any tips for a substitute in making bread or pizza dough? Hey Avery! I haven’t made bread before but if I were to attempt it, I’d use the coconut sugar. All the others would probably have noticeable effects on the taste. Same goes for pizza dough. This is a great guide! I’m guilty of using a lot of refined sugars when I bake, but I tend to bake for gatherings or meetings, so I don’t feel as bad about it. Feeding it to people once in a while won’t hurt them, right? At home, though, I try to avoid it. These are great options for sugar replacements. Like to see there are more out there than just sweet n low and Splenda that you may not think of. I am working on the sugar substitutes. I got a bag of coconut sugar on sale at TJ Maxx-I have been using it in my teas…not bad. You listed the substitutes I use. I don’t add sweeteners often but maple syrup is probably the one I use most often. This is really interesting! I will sometimes replace with substitutes but I have zero understanding of the science of baking so half my stuff ends up being chewy or hard! great tips! Im a big fan of using maple syrup, honey, agave or coconut sugar. I can’t remember the last time I made something with white or brown sugar! In smoothies, you can use cinnamon or nutmeg as a sweetener. I used to use honey or maple syrup to replace sugar (and I still use honey when baking bread). I bought a few bags of coconut sugar a wee while ago and have now started using it in my baked goods. I find that I only need about half the amount – but then I don’t have an overly sweet tooth. I plan on trying applesauce next.